Italian just the way India likes it! That’s the mantra at Little Italy – a restaurant chain – serving familiar flavours. Their buffets are all the rage with the office crowds and families. A crowd-puller, Little Italy has spread its wings and established quite a few branches around the city. The ones in Indiranagar and Koramangala are always busy , so, if you are looking for a quiet nook for lunch or dinner – we recommend you head to the one in Sadashivnagar or their other branches. On most days, patrons make a beeline at the lunch buffet table. 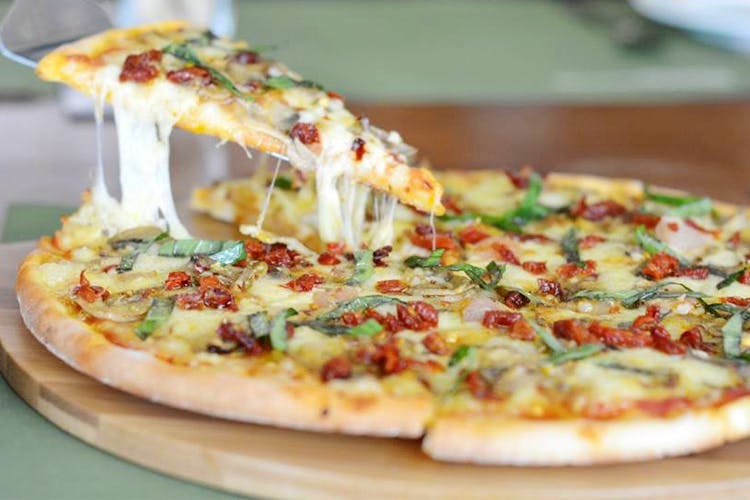 For a little more than INR 600 (the rates are considerably higher on the weekends), you can slurp on bowls of soup, bite into slices of pizza, help yourself to cheese-loaded pasta, and sweet slices of dessert (cheesecake is always popular). The menu rotates everyday so if there is something you are looking for, in particular, make sure you call ahead. But when you are not looking to stuff yourself to the gills, the a-la-carte menu will work splendidly. You can start off with a classic Caprese Salad – generous slices of mozzarella accompanies by tomato and basil. All you need is a drizzle of olive oil and this makes for a refreshing starter. The Special Crostini too is a hearty choice. You get warm slices of bread topped with crunchy bell peppers, bits of zucchini, sun-dried tomato and crumbles of mozzarella. Little Italy’s menu is tailor-made to the Indian palate. The pastas and pizzas are particularly popular. From the classic pasta section, we recommend the simple yet soul satisfying Puttanesca – where the pasta comes bathed in spicy, tomato sauce and is studded with olives, capers and basil. You can also order up Pesto Pizza – where the creamy pesto is adorned with slices of potato and mozzarella. Finish up with their slurp-worthy Tiramisu.